Liver o a sheep: (1) richt lobe, (2) left lobe, (3) caudate lobe, (4) quadrate lobe, (5) hepatic artery an portal vein, (6) hepatic lymph nodes, (7) gall bladder. 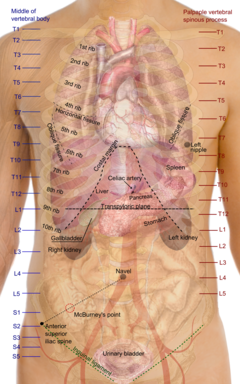 The liver is a vital organ o the digeestive seestem present in vertebrates an some ither ainimals. It haes a wide range o functions, includin detoxification, protein synthesis, an production o biochemicals necessary for digestion. The liver is necessary for survival; thare is currently na wey tae compensate for the absence o liver function in the lang term, awtho new liver dialysis techniques can be uised in the short term. This page wis last eeditit on 2 Mey 2017, at 04:41.